A great piece of art requires a great canvas! Now I hardly want to call my face a great piece of art, but what is true, that I try to have the best possible canvas when I do my make up. Another additional bonus to having a great canvas (or as normal people call it : skin! ), is that your husband/wife/boyfriend/girlfriend wont run away screaming when you take your make up off. Now some of these points are debatable. For example, there is by far no real study which proofs the context between nutrition and drinking and skin condition. However, I do notice that when I cut back my sugar and snacks and eat better and especially drink more, that my skin seems to clear right up and becomes more rosy. anecdotes do not equal evidence, so this is no proof that there is a connection, however, it works for me. If it's a placebo effect, then I just run with it. However, cleansing and moisturizing do help the skin. Now there is no one solution for everybody. So it is important to find out which products work for you and to be honest, I found there is just one way, test test test and do not believe every face science hype cream which they try to sell you for waaay too much money. And to make things easier (NOOOT) most of us are somewhere in between those. I am somewhere between the last three, depending on my hormones, season, stress level. I also have a rather sensitive skin, so I have to watch out what I smear on my face or I will have to deal with a break out. So to get to the products I am using now, I tried a lot of samples. I actually went to both drugstores and pharmacies. Pharmacies I feel are sometimes really underrated when it comes to skin advice. Plus my favourite pharmacy will always stock me up with loads of samples, so I can try a product before I spend money on it, just to throw it out afterwards, because it's not for me. I usually start by cleansing my face, if I am wearing make up, especially eye make up, I will first remove that one with a special eye make up remover. Then I will wash my face with either the bebe more cleansing mouse or the effaclair purifying foaming gel. I will use afterwards the micellar water from avene to remove rests of make up, I did not catch the first time or. About three times per week, I will use a peeling. At the moment I am trying the balea soft and clear washpeeling and I am rather happy with it. 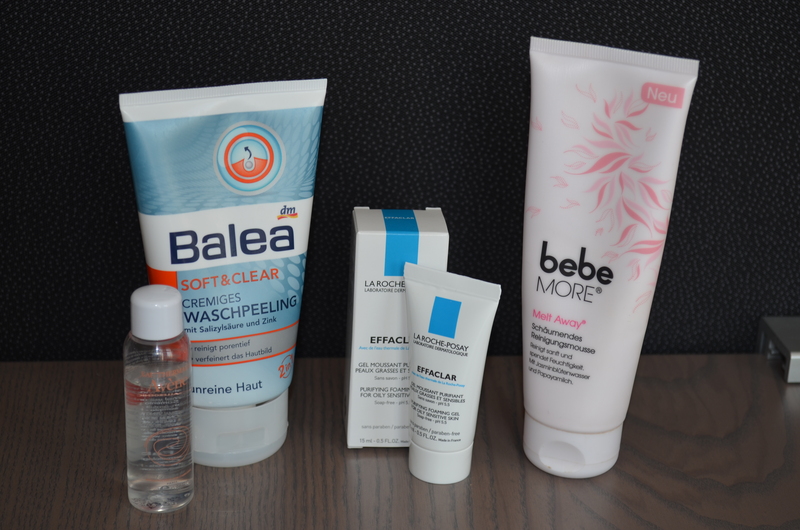 If I use a peeling, I do not use the micellar water afterwards, as I find that it dries my skin too much. The goal is to have a soft and clean skin, not a dry, red burning tomato face. I wash simply by making my skin slightly wet, applying the product and washing it off again with tap water. I tried sponges and wash cloth in between but found that it irritated my skin and really did not get my skin a lot cleaner. So well, back to easy peasy it is. If you have rather dry skin, you can use a milk to cleanse. However, since I have a rather oily skin, I find that it leaves my skin to fatty, so I rather go with a fat-free wash gel or foam. To be honest, I have fallen rather in love with the bebe more one, since I love the smell and the silky feeling on the skin. The effaclar is very effective and I just love La Roche posay products. So at this point I am not sure if I will stick with one of them or just keep on alternating both (It's a hard life ;) ). Price wise, the bebe more is for sure cheaper. 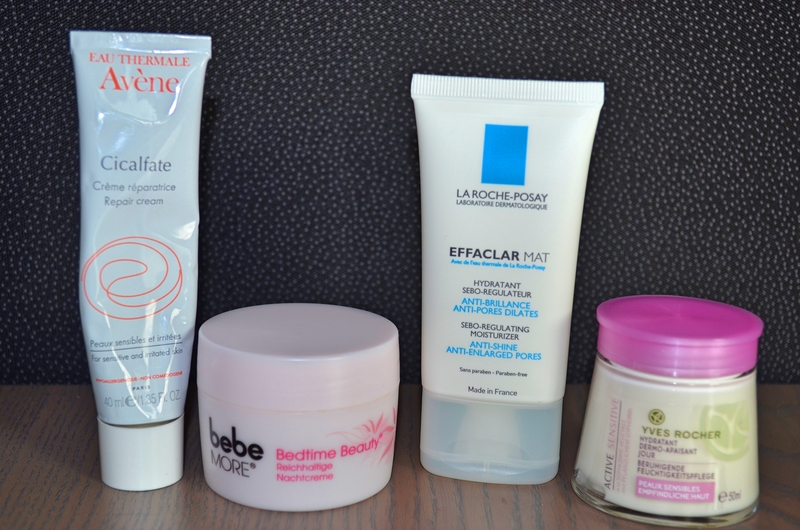 You can see in the photo that the pharmacy products (Avène and La Roche Possay) are sample sized and this is due to my lovely favourite pharmacy which supplies me with samples which I prefer to use up before I purchase the full (rather pricey) product. But I can assure you that I will do so with those two. I think I might keep the micellar water sample bottle though and refill it since it strikes me as perfect for travelling. The second and already last step is moisturizing. Now here again I have different products I used recently. For daytime I use Yves Rocher, Active Sensitive moisturizer. It is a decent moisturizer for sensitive skin and leaves my skin soft and well prepared for make up. 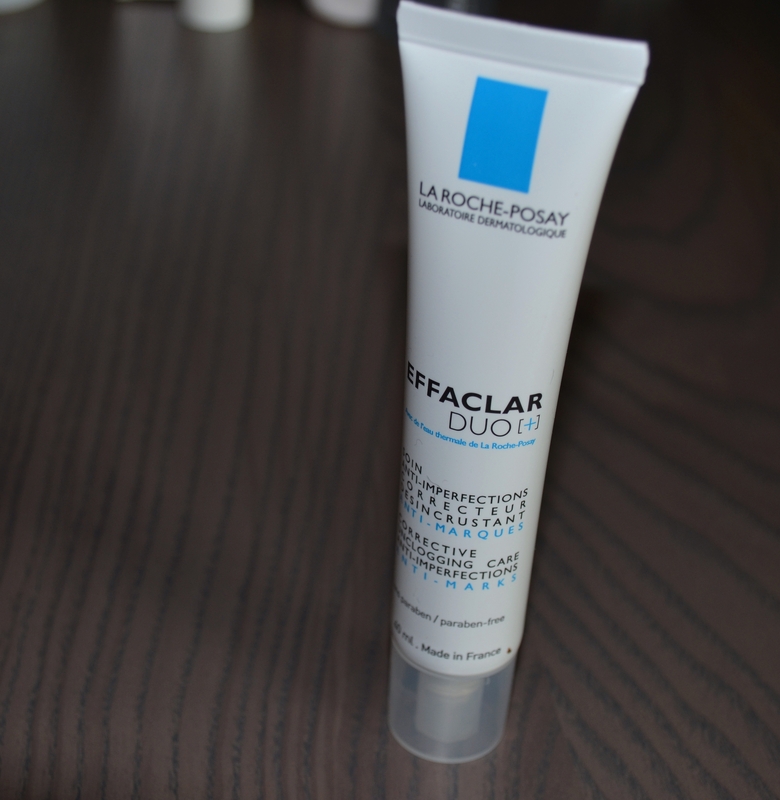 I recently purchased also the La Roche Posay Effaclar Mat moisturizer after trying a sample. Especially during times when my skin seems to be especially oily, it really helps to keep the shine out of my face while still keeping my skin well hydrated. Now, there is a thing to be said about night cremes. Actually, you do not need them. Your skin has no special need during the night which it does not have during the day. However, if I feel my skin does need some extra fats, I usually do it overnight because I then do not have to deal with an oily face to put make up on. However, when my skin is anyway already oily, I stay away from this and just stick to my day time moisturizers. But well for the occasions that I do use it, I use the bebe, bed time beauty moisturizer (I also use it because it smells amazing and makes me feel all ready for bed). The Avène Cicalfate repair cream I use when I either had a break out and want to help the skin to heal, or when I have for some reason a dry patch on my skin. It is an amazing moisturizer and a little wonder when it comes to wound healing or healing irritated skin. I daresay, if you have dry skin, I can just recommend to use that even more often, I would if I would have less oily skin. It is the La Roche Possay, Effaclar DUO+ anti imperfections lotion. You can use this one either directly on the break out or you can even use it on larger areas of the skin if necessary. I discovered this a while ago (also via a sample) and I do not want to be without it anymore. If you should go out into the sun and you are not planning to wear make up. You should still add a sun lotion or you should use a moisturizer which contains sun protectant. However, I am using a foundation which has an SPF and I also am indoors most of the day due to my job. If i go into the sun however, I will always apply a sun screen. So well, this is my skin care routine. Even though I have found nice products which work for me, I will go on testing new products since you never knew if something better is still out there. At the moment I am exited to try the dermatologica daily microfoliant which I also received as a sample. I will report back on how this one is working for me. This was a rather long post since I am way to passionate about these sort of products. How is your skin care routine? Which products work for you? Any secret tricks I do not know about? I am looking forward to read your comments!